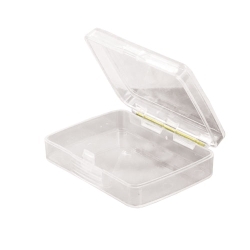 8-3/4" x 4-5/16" x 7/8" ID Clear Precision Box | U.S. Plastic Corp.
Made of styrene butadiene methyl methacrylate. Box features transparent clarity and impact resistance even in the harshest conditions. Excels in wet applications with its rust-proof hinge. Great for storing small parts, nuts, bolts, scrap booking and crafting supplies.